Yearbooks are a long-time tradition, but they can be quite costly for schools. Startup company TreeRing helps schools cut down on those costs by providing personalized yearbooks that are printed on demand for students. TreeRing lets schools save money by requiring no minimum orders and no financial commitment from schools. Parents or students purchase the yearbook directly from TreeRing and TreeRing will only print what is purchased so there are no leftover yearbooks. Parents and students over 13 can also personalize their own yearbook pages. Students can choose their own photos for their pages and even ask friends to create custom messages for them online. Their custom pages will only appear on their yearbook. TreeRing’s web-based yearbook builder is easy to use and lets users save their pages to the cloud so schools and students don’t have to worry about back-ups. The software also allows online sharing of photos to make it easy for anyone to submit a photo for the yearbook. The school yearbook business is a scandal. Here’s how to fix it. You wouldn't know it to look at the products, but the school yearbook business is kind of shady. There’s a good chance you and your kid’s school are paying way too much for yearbooks—sometimes thousands or tens of thousands a year too much. For schools and for parents, there are big costs to guessing wrong. If a school orders too few yearbooks, some kids who want a book will go without. That’s why schools tend to err on the side of guessing high—and then get stuck with unsold yearbooks, and a huge bill to the yearbook company. To cover costs of overprinting, some schools add an extra fee to the yearbooks—$10 or $20 per copy that you, the parent, must pay. Even so, lots of schools end up in hock to their yearbook providers. For instance, over the last few years, George Washington High School in San Francisco, one of the largest schools in the city, has had to eat the cost of so many unsold books that it now owes its yearbook company $50,000, according to the school’s yearbook adviser. When Aaron Greco, a young tech entrepreneur, started sniffing around the yearbook business a few years ago, he was surprised by these shenanigans. The fundamental problem with the yearbook business, he realized, was that big yearbook providers were producing their books using offset printing—an expensive printing system that’s great for books with large print runs but that leads to high costs and little flexibility for yearbooks, whose print runs number in the hundreds or low thousands. Over the past decade, we’ve seen the rise of digital on-demand printing, which is now commonly used for photo books (the sort you order from Shutterfly or Blurb) and self-publishing. Greco had a brilliant idea: Why not use the same printing process for yearbooks? Thus was born TreeRing, Greco’s four-year-old yearbook startup, which now serves 2,000 schools across the country and will produce about 200,000 yearbooks this year. By printing yearbooks on demand, TreeRing beats traditional yearbook companies in pretty much every way. When schools sign up with TreeRing, they don’t have to pay anything to the company—TreeRing’s only economic relationship is with parents who buy the yearbooks, so schools will never end up in debt to the firm. What’s more, the school doesn’t have to make a guess about how many yearbooks it needs, because TreeRing prints a book only after a student orders it. Digital printing also lets students customize their books—in addition to the “core” yearbook produced by the yearbook class, kids can add more pages that they design themselves. Finally—because schools don’t have to bake in the cost of overprinting, and because TreeRing prints books in the spring, when there’s excess capacity at on-demand printing facilities—TreeRing’s yearbooks are often cheaper than those offered by traditional yearbook providers. * TreeRing sells a 140-page hardcover yearbook—the average size for a high school—for around $50. That’s about $25 less than the price of a traditional high school yearbook. “When we go out to talk to schools and tell them what we do, there’s only one question we get,” Greco told me when I met him at TreeRing’s offices earlier this month: “ ‘What’s the catch?’ ” I wondered the same thing. At first, I suspected that TreeRing’s yearbooks might not look as good as those produced by offset printing. But Greco showed me a sample yearbook that looked great—the paper and print quality was fantastic, and the hardcover was glossy and substantial. It looked just as good as any school yearbook I’ve ever seen. Then I wondered if working on TreeRing’s yearbooks might be more difficult for schools’ yearbook staff and students. But Greco showed me the firm’s Web-based software, which works on even the most ancient machines, and which is drop-dead easy to learn. What’s more, because TreeRing saves all its pages in the cloud, schools don’t have to worry about backing up their stuff, and they can’t lose months of work when computers crash. TreeRing’s model also lets parents and students share photos with the yearbook class online. For instance, if the yearbook staff didn’t send a photographer to the baseball game but a parent happened to get a great shot of a senior sliding into home plate, the staff can use that photo the book. Some traditional yearbook firms have begun to add features that compete with TreeRing’s books. For instance, Josten’s, the granddaddy of the yearbook biz, now lets schools add customizable pages to their books. But Josten’s only allows up to four custom pages, and it charges $15 extra for the option. TreeRing’s books come with two free custom pages, and parents can buy more for $2 per page, and there’s no limit to how many they can add. What’s more, Jostens still uses a network of sales reps to sell to schools—which is more expensive than TreeRing’s online model. And it still requires schools to sign a contract that includes an estimated print run, which leads to expensive overruns. Greco managed to convince me that TreeRing’s model was better than that of traditional companies. But I did wonder one more thing—was his business doomed in the long run? As more and more of our kids’ lives move online, they no longer need printed books to remember what happened in school. You can always just flip back on your Facebook timeline—and Facebook has the added benefits of including just your friends and making you the center of attention. So why buy a yearbook? In this way, Greco sees TreeRing’s books as the perfect yearbook for the digital age. If you’re the kind of kid who wouldn’t normally make much of an appearance in the yearbook—you’re shy, you’re unpopular, you feel you’re above everyone else at your godforsaken school—at least you’ll be able to have a yearbook that doesn’t sideline you. So maybe you’ll want the yearbook that stars you, even if, in most other things, paper is dead to you. In 2009, TreeRing introduced the first yearbook that parents and students could customize online. Today, TreeRing is introducing the world’s first social yearbook by integrating the popularity of social networking with the safety of a private network for schools. The entire school community can share, like, and comment on photos, memories, and events from the school year. Parents and students are then able to personalize their yearbook by choosing the photos and memories they find most important, and have those photos and memories printed in their unique copy of the school yearbook. "Yearbook sales have been declining but not for lack of interest from schools and students," according to Aaron Greco, CEO of TreeRing. "In fact, the interest in preserving memories is greater and easier than ever thanks to social networks and digital photography. TreeRing is capitalizing on this trend by creating a safe way for students to use social networking tools to create their own unique, yet affordable yearbook that is free of cost to the school." 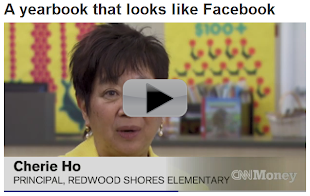 "Our school community is more engaged with the yearbook now that TreeRing has introduced Facebook-style features," said Jeanine Donohue, yearbook editor at St. Cecilia School in San Francisco. "It's easy for parents to help their children add memories, share photos and create personal pages to be printed in their unique copy of the yearbook." + Memories: Every student has the opportunity to capture their very best memories and moments with TreeRing – best friends, greatest moments, and special accomplishments. These memories are then printed in their very own personal copy of the school yearbook, uniquely for them. + Signatures: Signing yearbooks have gone high tech. TreeRing offers students the ability to not only electronically sign each other's yearbook, but to also include a personal photograph. + Social Media Integration: Students can add photos to their book directly from Facebook and Flickr. They can also share their personal pages with their TreeRing community or to other social sites such as Facebook and Pinterest. The new features are included in the TreeRing yearbook publishing platform and are available to all users free of charge.